Isn’t it interesting how things develop out of a little bit of necessity and creativity mixed in together? Sometimes I think that the world would be a very dull place if we just sat back and went with the flow of life. But here you have an example of a man who decided to make a toy for his son so that he could go out and ride around with the other boys and his mom wouldn’t worry, and the next thing you know you have the beginning of a new toy known as The Velocar. 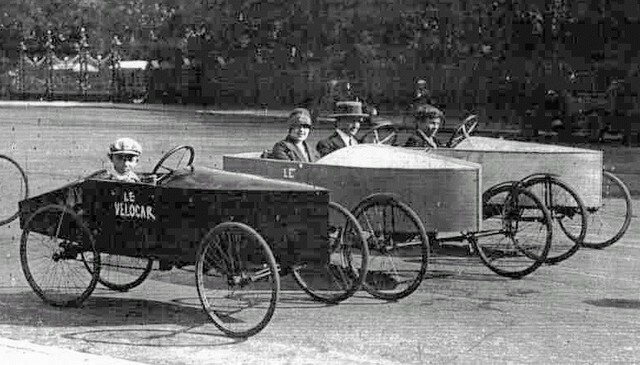 I wonder if Mr. Mochet knew what he was doing when he put that first car together or if the entire thing was mere luck? I also find myself wondering how many other inventions you could trace back that happened so similarly to the way this one came about? The Velocar is such an interesting invention, and the history behind it is very interesting, too. I wonder what other inventions were created because parents were a little overprotective of their children? The car seat, perhaps? The seat belt? 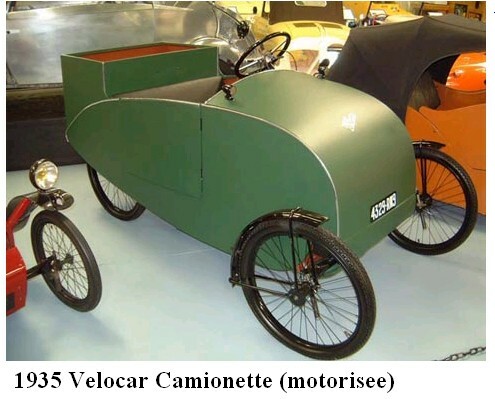 Motorcycle side cars? I wonder how much these cars are worth today? 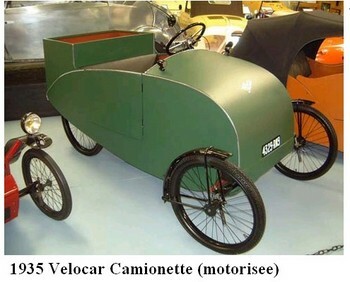 I’ve seen other vehicles similar to the Velocar, but they’re all much more modern and, honestly, not as interesting. I’d also like to learn more about Mochet and his life. Was he an engineer or some sort of scientist who would be familiar with how things worked, or was he an ordinary guy who happened to stumble onto a great design? Did he try to make the Velocar aerodynamic, or did he just create a shape he thought would look nice? Sorry for all the questions, but I find this subject very fascinating!